Concerns over drinking water quality, particularly lead and other metals associated with aging infrastructure but also waterborne diseases, continue to make headlines. But are these concerns well-founded? And if so, what can be done to reinvent public drinking water fountains in the era of the smart city and smart phone? A gallon of treated tap water from a typical municipal water system costs about half a cent—far cheaper than the cost of bottled water, which typically ranges from $1 to $5 per gallon (200 to 1,000 times more than tap water)! The provision of public drinking water is regulated by the Safe Drinking Water Act; bottled water safety is regulated by the U.S. Food and Drug Administration. A 2017 report by the Pacific Institute highlights the limited evidence of drinking fountain-related health issues; it also evaluates current drinking fountain technology (e.g., mouth guards to prevent direct contact) to identify features that can help ensure their safety, convenience and reliability. Perhaps the most striking improvement in drinking fountains in recent years has been explosive growth of the bottle-filling option, due in large part to their ease of use, the proliferation of refillable bottles, and a perceived reduced risk of contamination. The Pacific Institute report finds that most drinking water problems can be traced to contamination from poor cleaning and maintenance, aging water infrastructure in buildings, or both. We have reported previously on both challenges and opportunities associated with confronting the nation’s aging drinking water infrastructure. The report also provides specific recommendations (see box) that can help ensure the future safety and availability of this still valuable public health resource. For example, with the Flint, Michigan, water crisis raising public concerns around lead in tap water, the installation of contaminant-specific filters (e.g., activated carbon) can reduce some risks in fountains until aging pipes and other sources of contamination can be effectively replaced. If filters are the answer, water quality tests are necessary to first identify the most appropriate and economically feasible type of filter to install. And of course, filters must be maintained and replaced to remain effective. 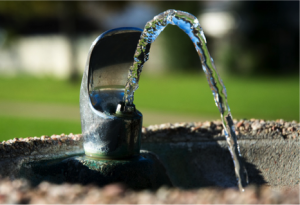 In 2012, the U.S. Environmental Protection Agency (EPA) announced a planned collaboration with the Conference of Mayors to “Bring Back the Water Fountain” to reinvigorate our nation’s supply of public drinking fountains and to publicize the benefits of drinking safe, affordable tap water. All that seems to remain of that initiative is an EPA Blog and editorials and articles such as our 2013 perspective that refer to it. Clearly, more concerted effort is needed. While all of us push for—and try to figure out how to pay for—systemic upgrades to our nation’s drinking water infrastructure, we must also engage with communities, parks, schools and other institutions to restore and build public trust in and appreciation of public drinking water fountains. One way to do just this was the Fountain Challenge at Michigan State University, where one of us (JR) teaches, and where competing student teams were recently awarded prizes for designing innovative, functional and aesthetically-pleasing indoor and outdoor public drinking water fountains in community, school or emergency response categories. Bruce K. Bernard, PhD, is President of SRA Consulting, Inc., Associate Editor of the International Journal of Toxicology, and lives in Cambridge, MD. Joan B. Rose, PhD, is the Homer Nowlin Chair in Water Research at Michigan State University, the editor of the Global Water Pathogen Project, and a member of the Water Quality & Health Council.